Derrylard Nurseries Ltd is situated on the shores of Lough Neagh where the River Bann enters the Lough, close to the M1 Motorway infrastructure. This part of North Armagh was traditionally a Soft fruit (strawberries, raspberries, etc) produce growing area. Many of the local apple traders at that time who primarily supplied the Belfast market where only too glad to handle this different produce in order to fill the gap that the apple season left. As the demands in the market changed, rhubarb, apples and soft fruit were gradually replaced on the Farm, firstly with outdoor lettuce and scallions, and then protected lettuce and outdoor iceberg. Nowadays round lettuce, celery, iceberg lettuce and a small stock of continental type lettuces represent our chief crops. The farm at present consists of about 60 acres in total, approximately 9 acres of this land has been covered with multi-span polytunnel structures, with 8 acres being frost protected with direct-fired Priva heaters. In these structures we grow round lettuce, celery, and continental type lettuces, along with a stock of cucumbers, peppers and courgettes during the summer months. 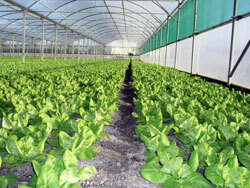 A further 20 acres of the land is used for the cultivating of iceberg and continental type lettuces. Nowadays the Belfast market, along with local wholesalers and a handful of local greengrocers only purchase a small portion of our production output. At present the majority of the produce we grow is now marketed directly to Supermarkets, with some iceberg, celery and continental type lettuces going to the processing market. The proprietors of the business are father and son, Seamus and Shane Donnelly. Shane has a Diploma in Horticulture from Warrenstown College, and completed his practical on a Nursery based in Lancashire. Seamus has vast experience within the harvesting and growing environment, his knowledge has come from a horticulture and family background. 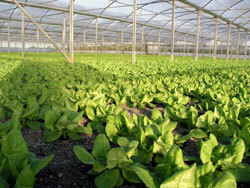 Derrylard Nurseries Ltd is audited and accredited annually, by both the BRC and Assured Produce. In July 2005 we changed our partnership status to that of a Limited Company.